Canoe Polo is a fast paced game played by two teams of five players in short kayaks, who compete to score goals on a rectangular pitch. The goals are suspended 2m above water at either end of the pitch, which can be in a swimming pool or open water. Players throw the ball or flick it with their paddle. The game is played at international level and several London clubs have regular polo teams. When played competitively, the game can involve a lot of contact and pushing, so good players need to be able to roll their kayak upright, using either their paddle or a ‘hand roll’. At this level, players must wear helmets, face guards and body protection. 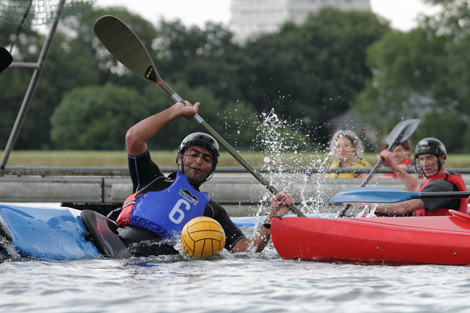 Canoe Polo is a great way to keep fit and improve both kayaking and ball skills. Campaigners have succeeded in bringing the 2016 World Canoe Polo Championships to London. The organisers aim to host the games on the iconic Serpentine lake in London’s Hyde Park, bringing Canoe Polo to a new and wider audience. For more information on Canoe Polo, check out these links.